…Until the Dallas Mavericks decided to play! In what was one of the greatest comebacks you’ll ever see in an NBA Finals game, the Dallas Mavericks went on a 22-5 run to steal game 2. After trailing by 15 points with six minutes to play, the Mavericks went on their improbable rally. 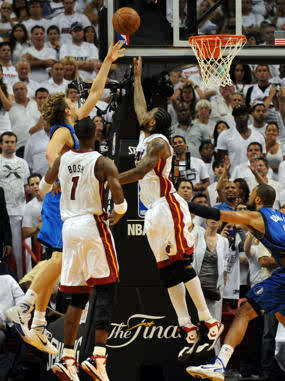 During the run, Miami’s LeBron James and DWayne Wade started forcing up tough shots and Dallas started running their offense. Down the stretch Dallas’ Dirk Nowitzki took over and scored his team’s last 9 points and finished with a team high 24 points and 11 rebounds. With less then a minute to play Nowitzki hit a 3 to put Dallas up 93-90. On Miami’s next possession Jason Terry inexplicably left Mario Chalmers wide open on the inbound and Chalmers calmly drained the wide open 3 to tie the game at 93. Dallas got the ball with 24.5 seconds left, let the clock run down and then put the ball in their superstar’s hand. With an inferior defender in Chris Bosh defending him, Nowitzki easily beat Bosh to the basket and made a left handed bank shot to put Dallas up 95-93 with 3.6 seconds to play. With no timeouts left DWayne Wade had to throw up a running 3-point attempt that clanked off the back of the rim as time expired. The Dallas Mavericks comeback was complete and now they’ll be square dancing back to Dallas with the series all squared a 1. 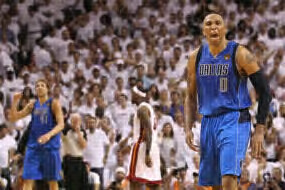 Shawn Marion had another terrific game with 20 points, and 8 rebounds. Jason Terry played well offensively late in the game and finished with 16 points. DWayne Wade led Miami with 36 points(0 in the final 7 minutes). LeBron James added 20 points in a losing effort. The series now moves to Dallas for the next three games tied 1-1.